On May 21st, cyclists gathered at Curtis Hixon Park in downtown Tampa sporting Wednesday night wearing reflective gear, helmets, and lights. These bicyclists decided to join the ride throughout downtown in an effort to raise awareness for bicycle and pedestrian safety on the roadways. Approximately 65 riders attended the Ride To Silence. Participants were escorted by the Tampa Police on their 11.1 mile bicycle ride. Tampa’s first Ride of Silence started back in 2011 as a response to the tragic fatalities in 2010. Organizer Jose Menendez started the local event to honor the twelve who were killed that year and to bring awareness to the community to prevent future accidents. 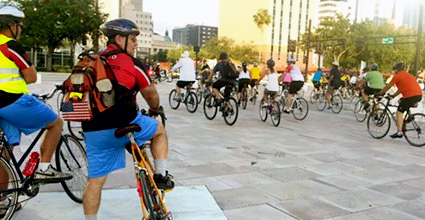 Many of the participants were local cyclists who know the conditions of Tampa’s roads. Some believe that Tampa was built for cars and motor vehicles and not for bicycles and pedestrians. They feel that it is this reason that there are so many accidents with bikers. Doreen Jesseph is a local rider who cycles regularly. She remembered many of the tragic accidents of individuals biking or walking to and from work. She decided to attend the Ride of Silence to honor those who have lost their lives and to help bring attention to the terrible conditions bikers and walkers face. Menendez hoped to bring attention to the road safety for bikers, but he also believes it is important for motorist and cyclists to do their part by following safety laws. It was important for the participants in the event to follow all the proper traffic laws. Cyclists are just like a car on the road. Organizers spoke to the riders and reminded them to stop at each traffic light or stop sign and to use hand signals to identity turns and even stops. Organizers and riders believed that it is important to be seen on the road to be safe. Lights and reflective gear is a must of cyclists and even walkers in the day and especially at night. Many of the riders wanted to show their support of road safety by attending the event, while some just wanted to join in the ride. The proactive and the passive riders came out in force this year because they love the ride and are ready for a safer road. Jesseph commented that the road conditions have been improving in recent years. The improvements are incremental, as Tampa remains the second worst city for bicyclists. The study, “Dangerous by Design” ranked four major cities in Florida as the top worst metropolitan areas for bicyclists. For as long as the road conditions are dangerous, events like Ride of Silence will be held locally and nationally. Image and information courtesy of Creative Loafing.